I've been so busy with both real life and the four Blitzkrieg in the West handbooks that I haven't had much time for any gaming this year. 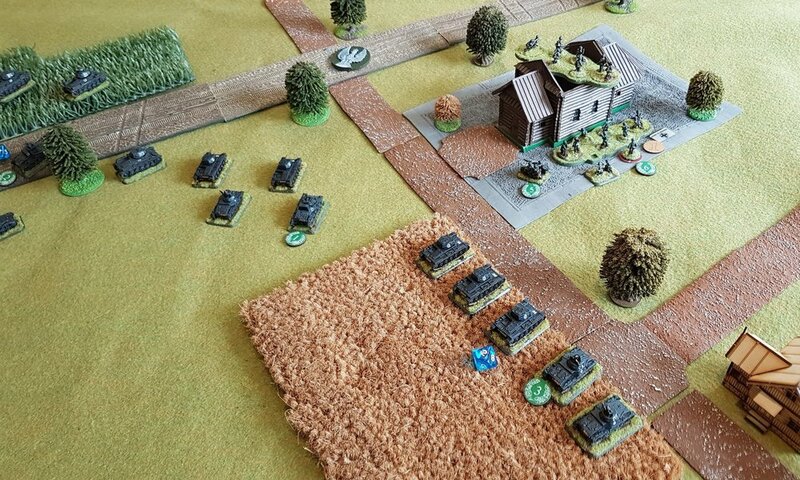 Fortunately that changed yesterday, with Dave and John coming over for a big September War battle that also gave me the chance to get my relatively newly painted Polish 7TP tanks onto the table for the first time. 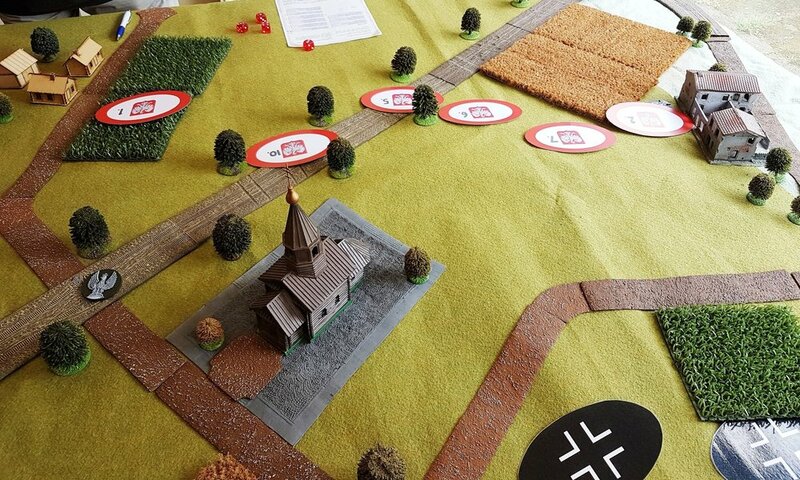 The game we played was scenario #45 from the second September War scenario pack: Piotrkow Trybunalski. 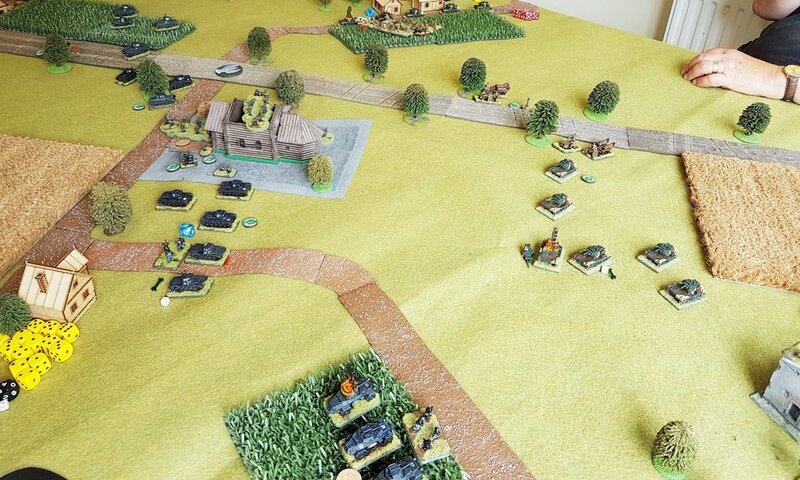 Taken from the events of 4th September 1939, the scenario covers the latter part of the fierce fighting for the Borowska Heights in the opening phases of the German invasion: where the Polish 2nd Light Tank Battalion was thrown into action against the advancing German 4th Panzer Division. This was going to be a straight up, head-on clash between two companies of tanks, each supported by infantry. 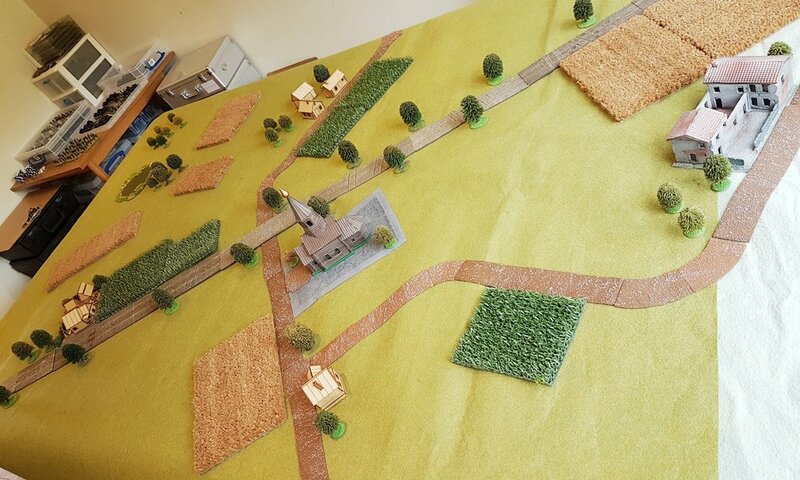 As you can see from the slightly weirdly angled picture, above, the battlefield was a largely flat area surrounding the town's church. The "main road" was a fair quality track that would aid movement, the smaller roads not so much. The crops in the various fields had all been harvested, it being September, but they would still provide some cover and be an obstacle to movement. As this was to be a straight forward clash, each side got to place an objective within an area approximately down the centre of the table. 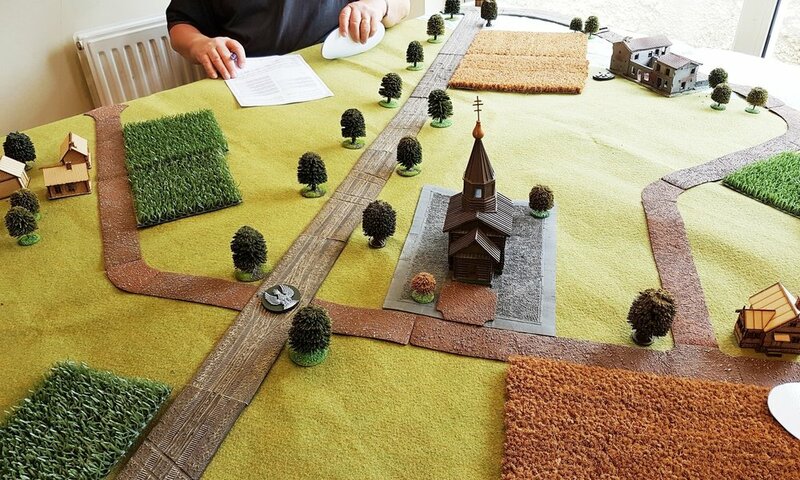 As you can see in the picture, below, the Germans placed their objective at the crossroads by the church, the Poles placed theirs just by the large farm at the far end. Victory would go to the side that controlled the most objectives at the end of the game, which would occur after nine appearances of the Turn Card. It was also dusk, so night could fall (with its associated difficulties of seeing anything!) at any time after six appearances of the Tea Break card. The Poles would attack with a two-platoon company of light tanks (eleven 7TPs) supported by a reduced company of infantry (three platoons of two 12-man infantry squads each) backed up by two tchanka-mounted MMGs and two anti-tank guns. 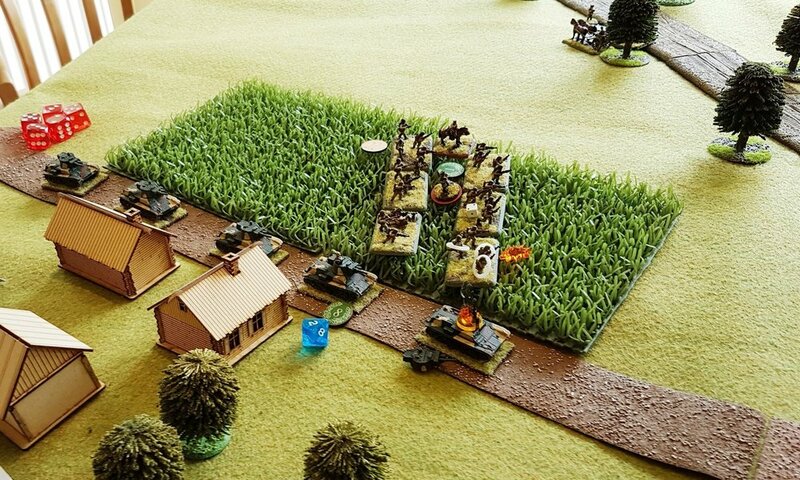 Some of their force had to be designated as reinforcements, to arrive later in the game, so one platoon of infantry and one platoon of tanks would start the game 'on the bench'. The Germans would attack with a full company of light tanks: a company HQ of four vehicles, and then three platoons each of three Panzer IIs and two Panzer Is. 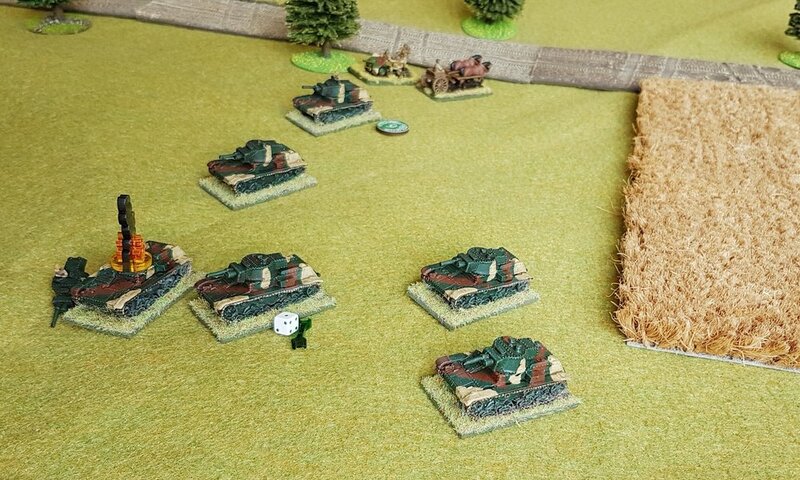 They also had infantry backing: three three-squad platoons of Schutzen infantry, with each squad armed with two light support weapons, backed up by a four-gun MMG platoon. A force with formidable firepower. They also had to designate two of their units as reinforcements, and chose the MMG platoon and one platoon of infantry as such. Both sides began the game by deploying their Blinds. The Poles opened proceedings by advancing their Blinds rapidly towards each objective. 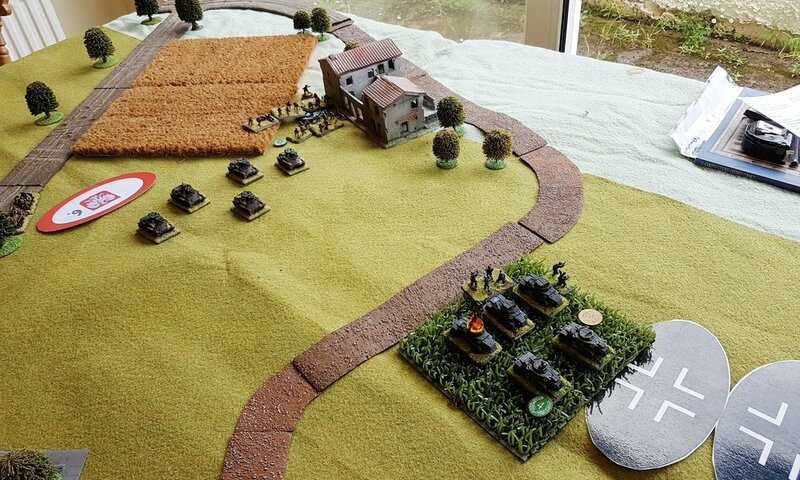 The Germans chose to hold back and spot: revealing a platoon of tanks and a platoon of infantry heading up the right hand side of the battlefield towards the objective by the farm. Polish spotting then revealed a platoon of German light tanks (here proxied by SdKfz 222 and SdKfz 221 armoured cars) lurking in a field, but an opening volley of fire from the 7TPs almost immediately knocked out one Panzer II and forced the crews of the other two to bail. First blood to the Poles! 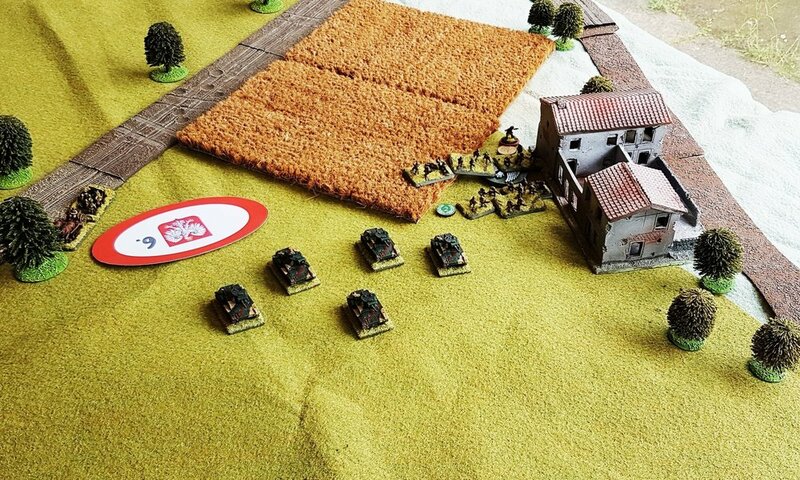 A few Polish scouts (a dummy Blind) were driven back from the centre-table objective, and the church captured by an infantry platoon, and it looked as if the objective was secure...but then Polish reinforcements arrived in the shape of a column of tanks, and the two Polish anti-tank guns deployed to face up to the advancing Panzers. 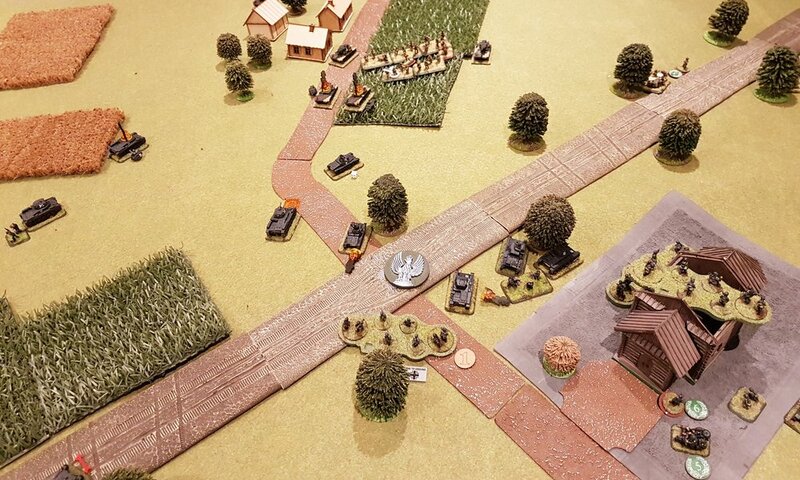 The lead 7TP was quickly dispatched, and for a time it looked as if the Poles had been bottled up in their column on the road, but they quickly sorted themselves and spread out. Meanwhile, on the right, a major battle for the farmhouse had broken out. 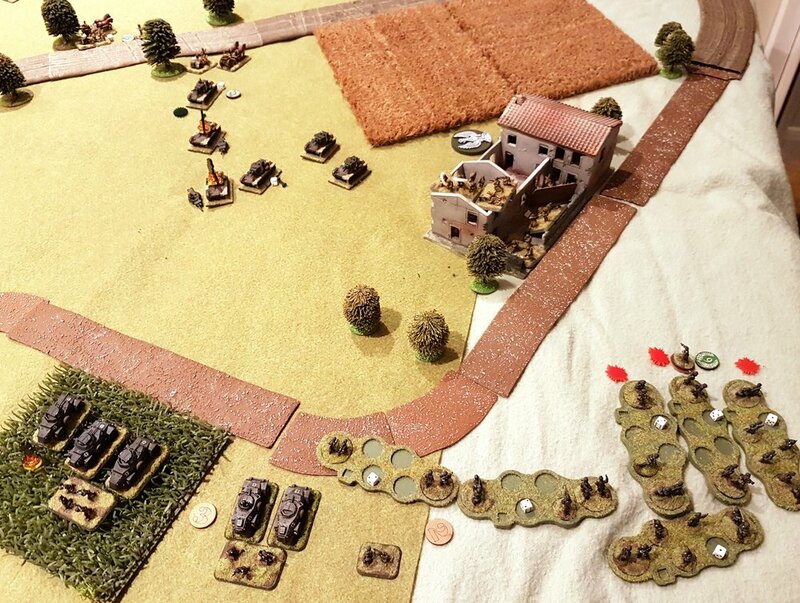 One of the Schutzen platoons had deployed and was attempting to suppress the Poles in the farmhouse with fire. Unfortunately, despite their superior firepower, they had discovered that walls do actually mean quite a lot when facing bullets, and were soon clearly getting the worst of things. Just to their left, a major tank battle had broken out, with six Polish tanks backed by one of their anti-tank guns versus the remaining seven Panzers in the area. Despite looking so strong, the Germans also soon discovered that autocannon and machine guns don't match 37mm guns, and soon there were fleeing Panzer crews everywhere! 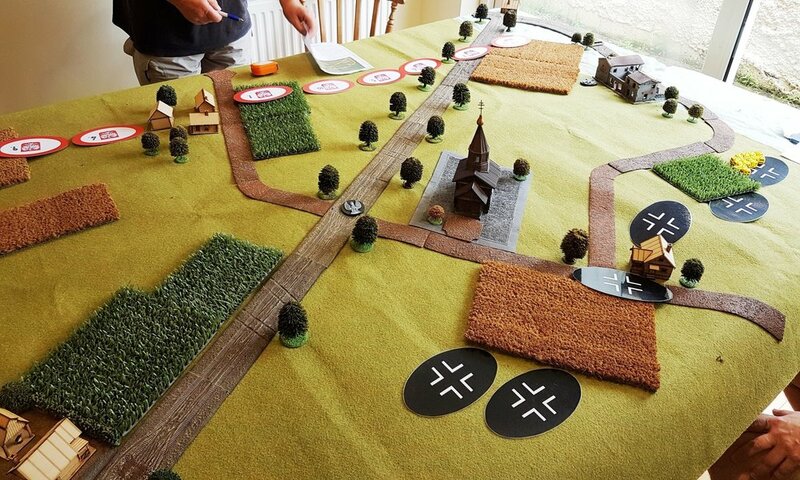 Despite the Germans throwing in another platoon of infantry against the farm, this is how that sector of the battle ended: the Poles in the farm holding the objective and killing German infantry at a 3:1 ratio, the six 7TPs and anti-tank gun outside the farm disposing of all but two of the ten Panzers facing them even if they lost two of their own number. Meanwhile, on the left, another major tank battle had broken out, with nine Panzers facing four 7TPs and an anti-tank gun. Unfortunately for the Germans, the story was largely the same. Although two of the 7TPs were destroyed, and bits knocked off the others, the Germans lost seven tanks in quick succession as 37mm shells hit them from all over. The Polish anti-tank gun did sterling work here: at one stage calmly knocking out one Panzer per shot despite taking incoming MG fire. At this point, night fell and the game ended. True to its historical outcome, the Germans had failed to make an immediate breakthrough. Looking at the carnage, it was obvious that the Poles had won a major victory in terms of material: only four out of nineteen Panzers were still operational versus only four casualties for the Poles, but as the game had to be declared a draw (one objective each) most of those Panzers would be dragged from the field and repaired, whereas the Poles couldn't really afford to lose a single tank. So that was the result: a draw with a significant morale victory to the Poles. A large and very interesting game. The Poles had a clear plan and, apart from a bit of a blip when their reinforcing tank column got caught bottled up on the road, made very good use of their assets. The Germans, on the other hand, never really made us of the firepower of their Schutzen infantry, with their two MG-34s per squad. On their right, they never really managed to suppress the farm, something they should have been able to do with 48 men in six two-LMG squads versus 24 men in two one-LMG squads. 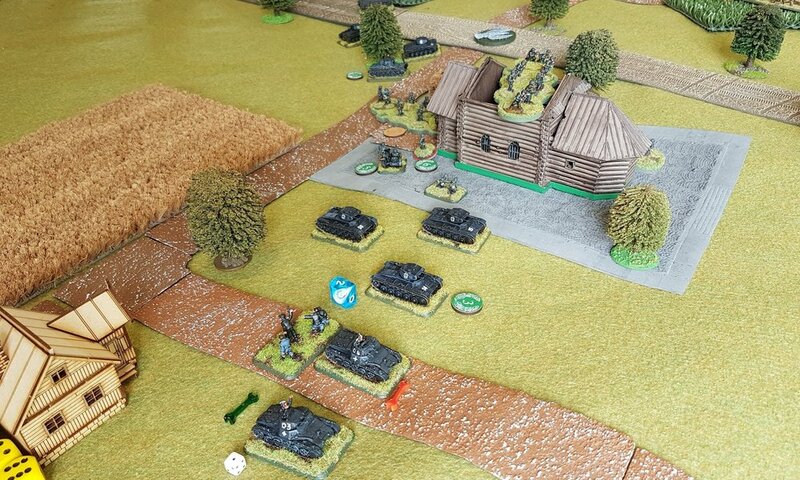 In the centre, they kept shooting at the Polish infantry hunkered down in the field in front of them, slowly whittling one squad down but not really achieving anything. Why, for example, didn't they shoot at the Polish anti-tank gun crews that were punishing their Panzers so badly? Had the game continued, I'm fairly sure it would have been a Polish victory, but a time limit is a time limit, and so a draw it was.